Not every gold buyer knows how to sell jewelry that's gold. So, I got to thinking it would be a good idea to write some selling gold jewelry tips to help vistors sail safely through this important area. There are many different ways of selling gold jewelry and your success all depends on knowing the type of jewelry you want to sell. There are two types of gold jewelry you can sell. 1. 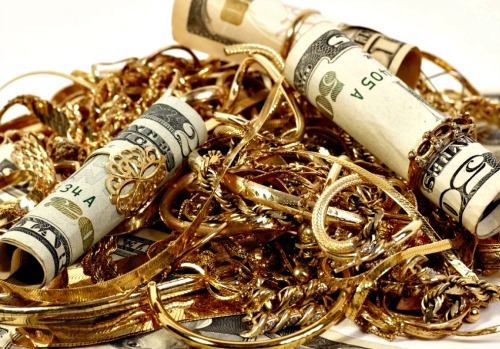 Unwanted Gold Jewelry: lost single earrings, gold chains, unwanted gold jewelry like ex's wedding band, random pieces, modern gold jewelry no longer wanted, antique jewelry that's beyond repair. 2. Wanted Gold Jewelry: Antique gold jewlery, estate gold jewelry, period gold jewelry. Not for scrap, collectible, rare and in good condition. People who invest in gold antique make money in direct proportion to the extent of their knowledge of the subject. The more you know about investing in gold antique jewelry, the more money you can make selling gold jewelry, antique and estate online, in-store or at local flea markets and auctions. It also pays to develop and eye, for identifying the best antique jewelry books you can lay your hands on. I once found a book at a yard sale for $1 about the early pearling days in Australia now out of print. In this book I discovered so much information about natural pearls. It was full of rare information on pearls that even the gemological institutes won't teach you. Are you dealing full or part-time? What price you bought the jewelry for in the first place. Do you need to make a quick profit? Can you afford to wait it out until the market is "just right"? How to sell jewelry that's collectible, is just like selling anything, whether it's selling watches or selling diamonds. Buy at a competitive price, keep your overheads under control and learn how to sell jewelry antique and estate for a profit, while all the time you try to expand and retain your clientele. Success on selling and expansion comes down to providing good service. Excellent service includes presenting your jewelry in a favorable and honest way, developing a relationship with your clients. How to sell jewelry antique at the right price? The best price is the price the buyer is prepared to pay, but that won't help you when it comes to writing up the price tag. As a general rule of thumb, most professional dealers who know how to invest money in jewelry try to make between 30 percent and 60 percent, however on lower priced jewelry around 100 percent is nearer the mark. In general, fine Antique Jewelry and higher priced pieces, return higher profits. The return on investment on some pieces of jewelry however can be way in excess of these figures if: 1. You've been buying gold on the dips 2. The Jewelry has increased in value and desirablility over time while you have been loving and wearing it! By keeping your prices competitive, you are more likely to achieve a faster turnover. In the long run, experience tells me this can be more profitable than holding out for higher prices. For example, it is better to sell two $250 pieces every week throughout the year at a 20 percent profit than two $1000 pieces a year with a 60 percent profit margin. If you take the first approach, you will make $5,200, and if you take the second approach, you will make $1,200. Keep your finger on the pulse of current market values at auctions and shops both on and off-line. Also, it pays to keep your eye on the auction fees involved. Some are high, and some are free and simple to use. See the classifieds at The Jewelry Exchange on Antique Jewelry Investor. There are many gold buyers out there, especially in the current squatus stinkum economy in which paper money isn't worth the paper it's written on. Buyers of all types of jewelry will often ask for a valuation certificate to authentic a piece of jewelry. Do not take this personal, an appraisal certificate is becoming the standard today and obtaining online jewelry appraisals are acceptable, hassle-free and affordable. When it comes down to selling gold jewelry, estate jewelry or antique, you just have to compare dealer shops at antique fairs to notice that some people just seem to get it, when it comes to the art of display. Taking this concept even further to the global on-line marketplace, some dealers have taught themselves how to photograph their jewelry that enables them to present their jewelry more attractively for potential jewelry buyers. Antique Jewelry Investors take note, how to buy antique & estate jewelry is completely the opposite of how to sell jewelry as far as presentation is concerned. Many a great bargain has been found on poorly laid out antique stalls whereas from a sellers point of view; the best prices are obtained from appealing antique shop windows or under glass. How to sell Jewelry that's old gold or antique, to maximize your return on investment, a number of things must be carefully considered and mastering the art of display is one of the most important.